Select method of payment near the bottom of the form. (Online with credit card or mailing a personal check). Tickets will be mailed only after payment is received. For late purchase (48 hours or less) tickets may be picked up at the performance desk at the concert location. Tickets for the Dec. 7th Christmas Concert are $50 for adults. *Tickets for the December 7th Christmas Concert are $50 each. All other concerts are $35 each. Tickets will by mailed to the address provided unless Will Call is selected. 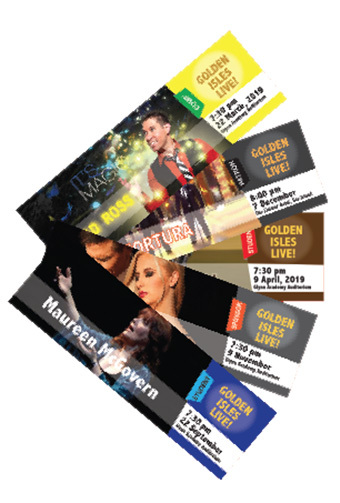 If mailing time is too short (6 days or less) they will be available at Will Call (the Performance Ticket Desk). Please enter name(s) as you would like them to appear in the Golden Isles Live! publications. Salutation: Select Mr. Mrs. Ms. Mr. and Mrs. Dr. Dr. and Mrs.
*Tickets will be mailed or held at Will Call ONLY after check has been received! Press "Transmit Form and Pay" to complete transaction.